I also like it because as you can see from the Replacements listing, it comes in SO MUCH STUFF. There's even a line of Fire King Blue Heaven stuff. The crazy hoarder in me dreams of having everything in Blue Heaven. 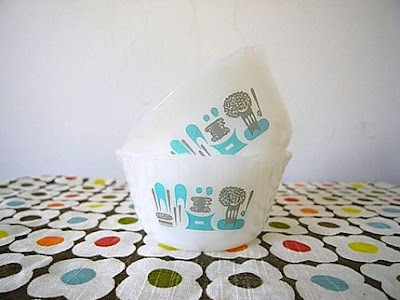 Right down to these darling Fire King custard cups. The only draw back is that I can't seem to find a pattern name. 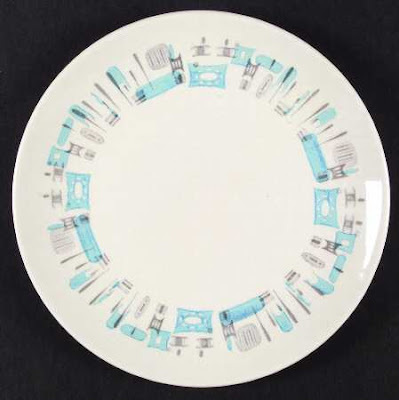 I know it's by Homer Laughlin, and I know it's from the Rhythm Line, but the pattern seems to be known by a number and letter combination: JJ167 They have some of it here at Replacements, Inc., but not as much as I'd love to see... I wish I could see what the rest of the pieces look like. But I'm just in love with it. I love the aqua color, and the way the leaves are so detailed. Lovely! When I was on ebay looking for more of it, I found another Rhythm pattern that I want for my "every day" china. And the two patterns really look lovely together. The other set is slightly similar to Homer Laughlin's FiestaWare, but it's solid gray. And since it's from the Rhythm line, the shapes should be the same as the JJ167. 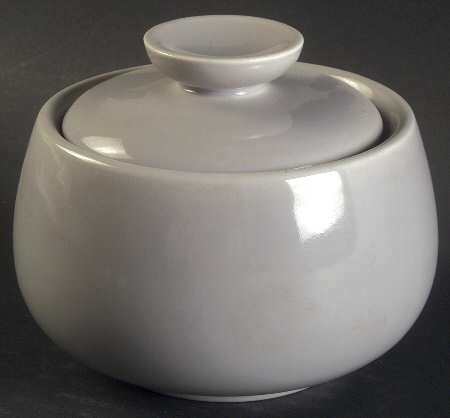 I just love the color gray, and the simplicity of the china. I think it's timeless, even though it dates from the mid-1950's. Look at this sugar bowl! How adorable is that? And I think the gray matches the gray in the JJ167 very nicely (not that that is necessary, but if it was all in a sweet mid-century modern hutch, it would look pretty sitting near each other. Just saying.). The best part of both sets? Even Justin likes them. He is surprisingly picky about such things, but he thinks they are both very nice looking. He just doesn't share my enthusiasm for random bits of pottery... This set is also on Replacements, and seems to be slightly more complete. And there's quite a bit of it on ebay. Once funds are restored, I want to get a few pieces to start out! My plan is to just buy a piece here and there and slowly build a collection. 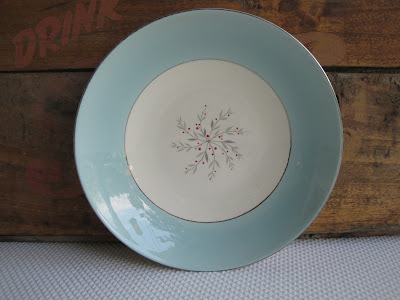 In the mean time, I have a collection of various brands of vintage plates that mostly feature floral designs. So if I'm able to collect some pieces here and there, they will blend right in with the mismatched sets. But some day, I hope I will have that hutch full of these pretty things! And for the record, all of this silliness was brought on by an inspirational Apartment Therapy article about how you should buy things as you can afford them and not worry about getting the whole set at once. Of course, now that article seems to have disappeared, but I promise, it was oddly motivating for me. It's particularly nice to pick vintage china to collect, since you don't have to worry much about it being discontinued, and pieces only become available sporadically. Last note... The neighbor who backs us is playing music REALLY loud. First, it was a Phil Collins song and now he's rocking "Piano Man." Yeah. Can I call the cops to complain about that? Is there a special section in the criminal code about blasting your neighbors with Billy Joel? If not... there should be :P I'm also thinking about starting a piece by piece collection of the atomic looking Franciscan "Starburst" I think its called. I met a woman who has the whole set and mumbles around about selling it but after looking it up on Ebay I think I'm too poor to buy it all from her. So piece by piece it is! Thanks for stopping by! Your blog is lovely! I found a set of JJ167 at a thrift store years ago - I love it too! I did some research. The pattern doesn't have a name. It was made to sell at a dime store - JJ Newberry. HL did lots of unmarked patterns that only sold at certain stores. The only piece that will be marked is the vegetable bowl. All the other pieces are blank on the back. That will make it hard to find sometimes, since the seller won't know what they have.